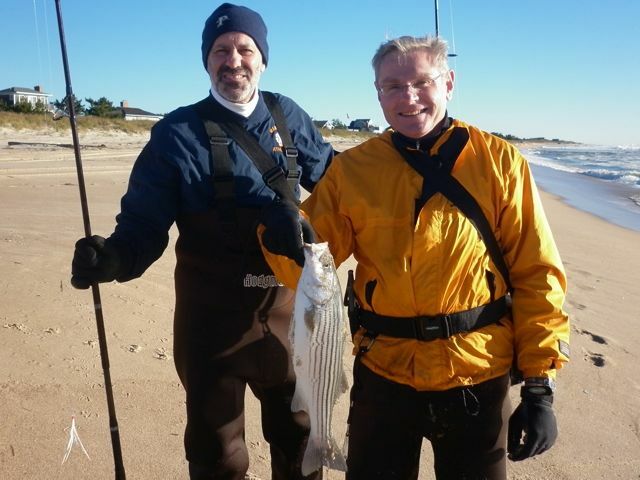 Tenacious Billy S. wraps up the honor; keeps on fishing…and fishing…and fishing…..
Nov. 29, 2010: As I write this, Bucktailin’ Billy S. is somewhere on the East End of Long Island, surfcasting Dusty Springfield style. That is, he’s “wishing and hoping” that rumors of a herring run, able to produce 11th hour keeper bass, are something more than just that: rumors. On tenacity alone, Billy vanquished all comers this season. But for 2010 Surf Rookie of The Year honors he had a worthy rival in Joltin’ John P. who scored high in fish caught per session. 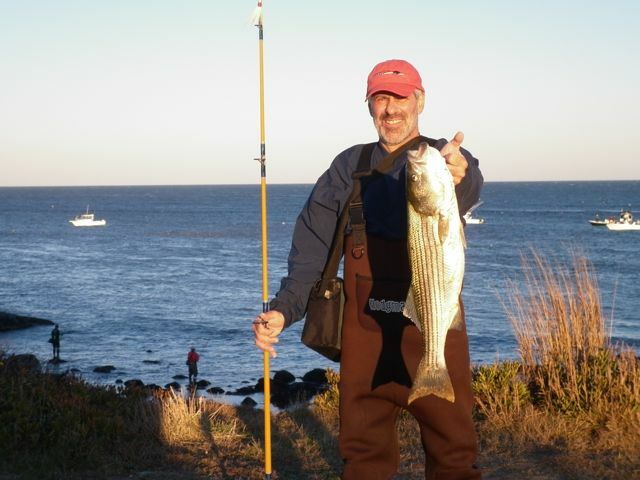 John had a solid October with a keeper at Montauk and schoolies in East Hampton. 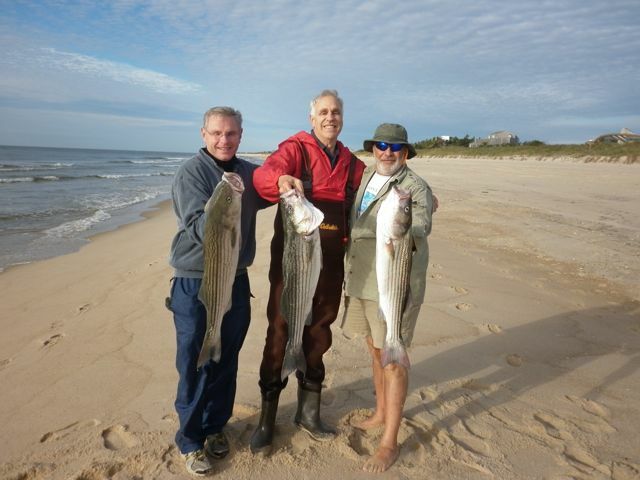 Billy caught a decent amount of bluefish and bass the whole season long, including his first keeper striper from the surf in late October. 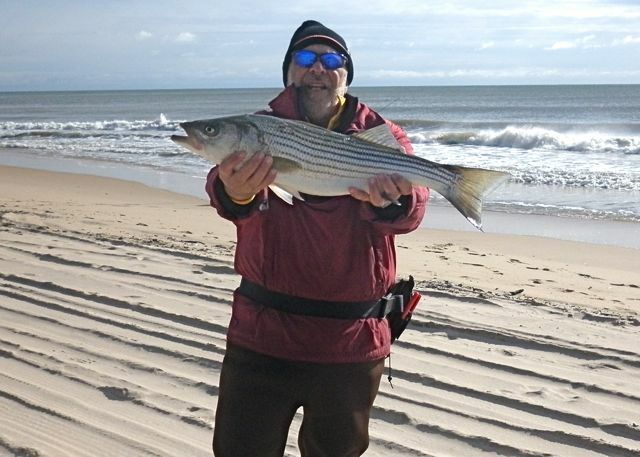 Billy essentially sealed the deal on his award when he and Joltin’ John P. fished the sand eel invasion at Napeague Lane, Amagansett, head-to-head on the weekend of Nov. 13-14. For three days prior, big NE winds and extreme new moon tides conspired against good fishing so there was no bass fillets for the table when we all sat down with our wives for a night-before dinner. Instead we feasted on striped bass brandade and fish chowder both of which were cobbled together from the remains and morsels of my pre-Veteran’s Day keeper. It was a spirited evening–literally–fueled by a copious amount of wine hauled in by John P. Was this his attempt to influence the judges? Wait, there were no judges. Surf Roookie of the Year was decided by the catch. And the next morning, Billy managed a lone schoolie to keep the skunk off our party and chisel his name indelibly into the rookie leaderboard. He then had the temerity to leave the beach for an 11am tee-time at Montauk Downs–where he scored his first ever hole in one on Montauk’s par-3 2nd hole. Congrats to Billy S., evermore known as Tenacious Bill. 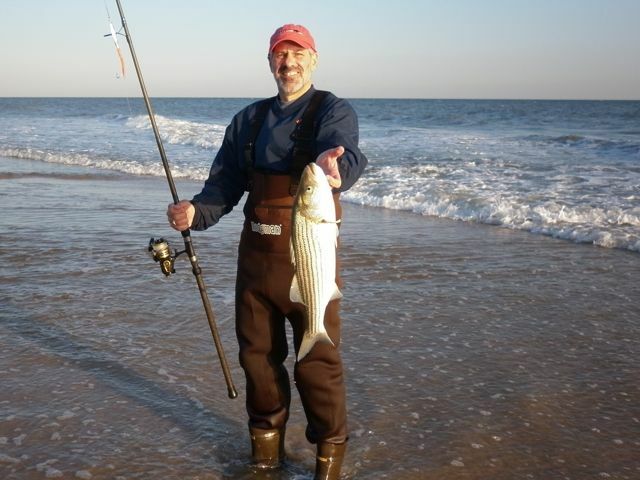 A salute as well to John P., and all those I had the pleasure to fish with in 2010. This entry was posted on Monday, November 29th, 2010 at 5:10 pm and is filed under Uncategorized. You can follow any responses to this entry through the RSS 2.0 feed. You can leave a response, or trackback from your own site. What do you live on the web? When I am not fishing, it seems that way. Congrats to John & Bill on their stellar inaugural season.